Over the last year or so we have seen a steady rise in the number of export enquiries that come in – increasingly from the US/Canada or Australia. The internet has made it far easier for people across the globe to stumble upon niche businesses like ours (our video for the Homewood Heritage has now racked up more views from the USA than everywhere else combined), and the rising Australian dollar has no doubt contributed to the jump in enquiries from that quarter. While it’s great – we really do appreciate your interest in our stoves, and are flattered by people’s enthusiasm for Homewood – we are not currently in a position to export, so do not yet have any firm plans to do so. As outlined in this post, for now we are kept plenty busy with just New Zealand. We’re still very much a small family business, and while we’re looking to increase our production capacity over the next six months, we are going to have our hands full with domestic orders and the launch of our Companion model. This means that even if we did have international agents or distribution systems in place, the production to match it is just not there right now. We sell direct to our customers in NZ without any retail presence, non-existent advertising and fairly limited field days exposure. The vast majority of our orders come through our website or from people who know someone who already has a Homewood. We’re hoping this means we still have plenty of opportunities for expansion domestically, which isn’t going to help for overseas markets. If we did have the capacity, the Australian market seems very appealing. The AUD is currently high, making our stoves increasingly affordable, and many southern parts of Australia have a strong history of wood-fuelled self-reliance – and an abundance of renewable wood! You’re close geographically, which goes a long way to keeping freight and support costs down, and NZ/Australia have strong trade ties with minimal red-tape. Additionally, our stoves have been tested to AS/NZS 2918, a standard that is common between our two countries, meaning our stoves are already compliant with Australian regulations. For all these reasons, if and when we have the capacity, Australia will be the first place we’ll look to in any serious way. The USD is low and volatile, making our stoves increasingly costly in comparison with local alternatives. Being on the opposite side of the planet, freight and support costs become a major consideration, and could easily end up pricing us out of the market. Import regulations are more complicated, and our stoves have never been tested under any standard that your insurance companies or local authorities would recognise. It is too premature for us to look into, but even just testing for compliance could be prohibitively expensive for a business of our size. People often ask whether we would consider sending a single unit to [Wherever]. Unfortunately, at this stage it just wouldn’t really make any sense for us. I could add you to our NZ waiting list, charge in NZD (GST shouldn’t apply), and ship to any NZ port or export agent you nominate, but there are complications. We would have to work out a compromise on warranty (as we couldn’t afford to have Dad or I fly out to [Wherever] in the unlikely event of any issues), and you would have to handle all of the export/import costs and arrangements, and would be responsible for achieving a compliant installation. If you were really desperate, we’d consider doing that for Australia, as at least there we’d have the confidence of reduced liability due to the shared testing standard. So when will we start exporting? We’d love to be able to get our stoves out to the people who want them, regardless of where they live. Like most things at Homewood though, it’s not something we will rush into. 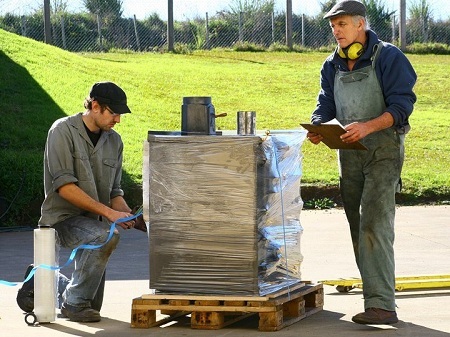 As above, if we do find ourselves with excess capacity at any point in the upcoming years we will look at ways to bring our cooking stoves to Australia first. If you like our stoves, and your building plans or dream home purchase is years rather than months away, then do keep an eye on this website or our facebook page. We’ll be making quite the hullabaloo should they ever become available outside of NZ!